Later, the bill was introduced in the parliament several times, but could not be passed as there was so much opposition to the bill in the Lok Sabha. After several unsuccessful attempts at Lok Sabha, the bill was introduced in the Rajya Sabha in 2009. On recommendation of parliamentary standing committee on Law and justice, the bill was passed in Rajya Sabha in 2010. Since then, it is pending in the Lok Sabha. 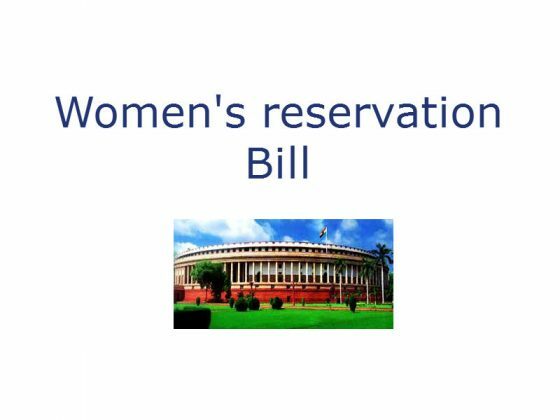 This bill is seeking for reservation of 1/3rd seats for women in the Lok Sabha and in the state Assemblies and also for quota within quota in the case of SC & ST reservation in the Lok Sabha and the state assemblies. That means it’s recommending reservation of 1/3rd seats for women among the caste based reserved seats too. This reservation will cease 15 years after the commencement of the Act. Seats will be allocated in a rotational method. A constituency will be reserved only once in the three consecutive general elections. So, in 15 years every constituency will have a women representative atleast for one term. Prior to this bill, there were 73rd and 74th amendments in 1993, which allowed reservation of 1/3rd seats for women in Panchayats. More political opportunities for women. Women’s social, economic status will increases. Women’s issues will be given enough importance in the parliament and state assemblies. Having a women representative for every constituency for at least one term in the 15 years is a big step towards reducing the gender gap. Though there are chances of misusing reservation, a large number of women, who have genuine interest to develop their constituency will be benefited. Few people argue that this bill may continue even after 15 years. But lets think practically, when equality exists really, no one will support reservations. We are striving for equality. This affirmative action is for level playing field, but not for discrimination of others. Some politicians have fear that this bill may discriminate men. But it doesn’t. Because men have a wide range of opportunities already. They are socially and economically forward with high literacy rates compared to women. And the important thing to note here is that this bill will be applicable only for 15 years after the commencement of the Act. This is only for a short term, and is targeted towards fast paced empowerment of women. At present the reservation for SC & ST categories in Lok Sabha & State assemblies accounts to 22%. If this bill is passed, the total reservation will be 55%. This will decrease the chances for general category contestants. This bill benefits the women of elite groups more than the women of poor economic & social background. Because of the rotational method MPs and MLAs may not work with dedication as they don’t need to win the local people to vote in favor of them in the next elections. Few minority communities may not utilize this opportunity, as most of the women in these communities are less capable of utilizing this opportunity. This may lead to the sense of perceived negligence among them. Those, who are elected through reservation and with no competition, if lack skills, the development of the constituency will be at stake. In Panchayats, few women representatives are acting as puppets in the hands of their husbands. This may repeat in the case of women’s reservation in the parliament too. Reservation for lower castes was also started with the promise of abolishing it in 15 years. But it is still continuing. So, there is no guarantee that the women’s reservation in parliament will cease after 15 years. Some politicians are saying that reservation for women in political parties serves the purpose better than the reservation in parliament. Samajwadi party demanding the reservation within reservation. That means in this 1/3rd seats, it is demanding the reservation for OBC,SC & ST women. This reservation must not be used by the kith and kin of the politicians, who are already in the power. Reservation must not be used by more than one member of the family at a time. Women’s reservation bill is the need of the hour. Of course this bill may be misused by few like any other bill. But, if this is introduced, a large no. of women will be benefited. This will inspire and empower women and can act as a level playing field.